The Rajya Sabha on Wednesday passed the Constitution amendment Bill to provide 10 per cent reservation in jobs and education, including privately run institutes of higher education, to economically backward sections in the general category. The Lok Sabha had passed the Bill on Tuesday. It will become a law as soon as President Ram Nath Kovind signs it, and does not need ratification by state legislatures, ministers said. During the debate on the Bill in the Rajya Sabha, nearly all opposition parties said the Narendra Modi government had pushed through a Bill full of lacunae with an eye on the 2019 Lok Sabha polls as the BJP’s recent electoral losses in three Hindi heartland states had left it shaken, and cautioned that it was unlikely to survive judicial scrutiny. Fears that the move would open a Pandora’s Box came true when Samajwadi Party (SP) and Bahujan Samaj Party (BSP) members demanded that the quotas for Scheduled Castes and Other Backward Classes, or OBCs, be increased in proportion to their respective populations now that the government had breached the Supreme Court-mandated 50 per cent cap on reservations. Members also asked if the BJP-led Mahrashtra government’s recent efforts to provide reservation to Marathas would be part of this, and if Jats, Gujjars and Patidars would also be included in this 10 per cent quota. Law Minister Ravi Shankar Prasad likened the government’s move to slog overs in the limited over cricket. “In cricket, slog overs have sixers. This is the first sixer. There will be more sixers. Who will lose (Lok Sabha polls), the public will decide. We will have huge majority under the leadership of Modi,” he said. After the passage of the Bill, the PM tweeted that he was “delighted” and “glad to see such widespread support for the Bill”. 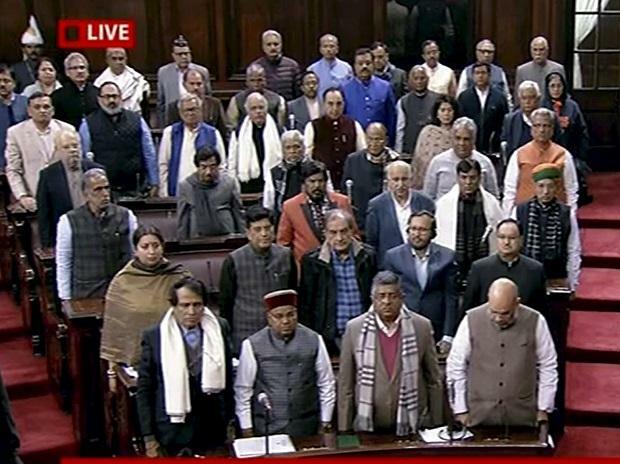 The Rajya Sabha passed the Bill with 165 members voting in favour, and seven against. The AIADMK and the Aam Aadmi Party staged a walkout, while the Rashtriya Janata Dal, the DMK and the Muslim League opposed the Bill. Prasad said the 10 per cent reservation would be applicable to jobs in both central and state governments. He said the legislation gave powers to states to decide on the economic criteria for defining the beneficiaries. A state, for instance, can fix annual income of Rs 5 lakh as the criterion for availing of the reservation in jobs and educational institutions. The Constitution would give states the powers to fix that, he said. The government has proposed that the youth from households earning less than Rs 8 lakh per annum or owning less than five acres of agriculture land, among other criteria, could benefit from the quota. He slammed the Congress for failing to implement the Major General S R Sinho committee’s report that suggested reservation for economically weaker sections in 2010. Congress MP Kapil Sibal sought to know if the government had collected any demographic data on economically weaker sections, and what would happen in states where dalits and OBCs were in majority. He wondered if this Bill would stand scrutiny of the nine-member Bench of the Supreme Court that stuck down 10 per cent reservation to EWS while delivering the Mandal judgment in 1992. “How many people have 5 acres of land, 100-yard plot, 1,000-sq ft house? Have you collected any data? It took 10 years to implement the Mandal Commission report (on reservation to SC/ST). Now you want to pass the Bill in a day without any data,” he said. Sibal said the central government had managed to create only 45,000 jobs annually in the last five years. “If you give 10 per cent reservation, you will give 4,500 jobs. You brought this Bill to benefit 4,500 people?” Sibal said that breaching the 50 per cent reservation cap was a "violation" at a time when similar cases were pending in the court. Samajwadi Party’s Ram Gopal Yadav gave data that indicated how even the reserved category seats in bureaucracy, not just upper echelons but also lower level services, for SCs, STs and OBCs did not get filled, and general category occupied 60 per cent or more of these positions. Members said Rs 8 lakh annual household income limit was unrealistic, as it would cover nearly 98 per cent of all likely beneficiaries of the proposed 10 per cent quota. They also pointed out the incongruity how those earning more than Rs 2.5 lakh had to pay income tax, but the Bill identified all earning up to Rs 8 lakh annually as economically backward. Union minister Ram Vilas Paswan, a BJP ally, repeated his demand for 60 per cent reservation in private sector jobs. Terming the Bill as unconstitutional and unsustainable, AIDMK's A Navaneethakrishnan said the Tamil Nadu government already provided reservations of 69 per cent to backward classes and the Bill would impact the 31 per cent people who fell in “open quota” in the state. Trinamool Congress’ Derek O' Brien said his party was "disgusted and angry" at the government frequently bypassing parliamentary procedures to invite public opinion and standing committee scrutiny and was "insulting" Parliament, and the Bill was another instance of Modi government’s “cheat India” schemes. BSP’s Satish Chandra Mishra said the Bill was not just a fraud on the Constitution but “a fraud on the upper castes”, who would suffer the most because of this Bill. He said the government brought it in panic after SP chief Akhilesh Yadav and BSP chief Mayawati had come together in Uttar Pradesh. Members like Congress’s Kumari Selja and AAP’s Sanjay Singh said the Bill was part of the larger Rashtriya Swayamsevak Sangh’s design to discredit the quotas that SCs, STs and OBCs got. However, Congress's Husain Dalwai said the proposed law would help reduce the stigma that beneficiaries of quota from dalits, tribals and backward castes suffered at the hands of upper castes.